“Pultrusion” is a continuous process for manufacture of composite materials with a constant cross-section. Material is pulled through a die compared to extrusions, which are pushed through a die. Composites are material matrices made up of two or more individual components; glass reinforcing fibers and thermosetting polymer resin, whose combined physical strength exceeds the properties of either individually. The fabric provides the strength and the resin acts as a binder distributing the load and providing dimensional stability. “FRP” is the acronym for fiber reinforced polymer. Fiberglass pultruded profiles are not new. The first patents for pultrusions were issued in 1946 for applications that had heavy walls and did not require specific tolerances (e.g. fiberglass ladders). The entry of fiberglass into the fenestration industry (doors and windows) came about with the ability to maximize the glass content to a minimum of 60%, which increased the physical properties (strength). This allowed engineers and designers to thin down the wall thickness as low as 0.07″ (1.78mm), while still maintaining designed strength. Design potential is limited only by the requirement that the shape be constant over the length of the profile. The high glass content improved many of the properties by stabilizing the resins. Lineal profiles of intricate shapes are achieved with a new inert material with tight tolerances and mechanical properties rivaling metal. Continuous fiberglass reinforcements, in the form of roving and glass mat, are fed from a creel to a resin impregnation station, to coat each fiber with a specially formulated polymer thermosetting resin mixture (wet out). 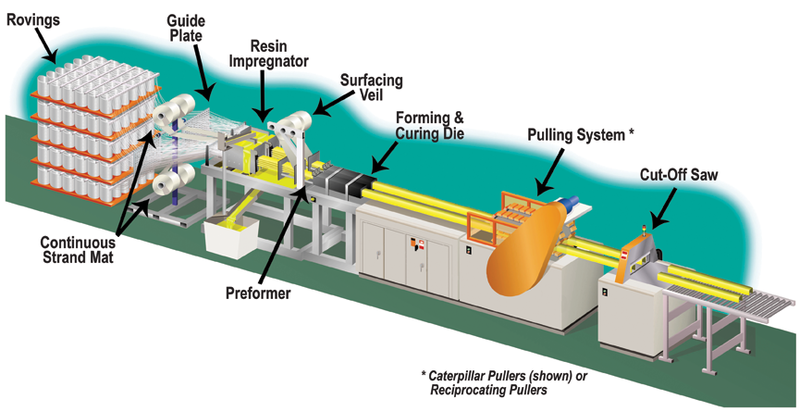 The coated fibers are assembled, by shaping guides into the preformer, which squeezes away excess resin, as the product is moving forward and gently shapes the materials prior to entering the forming and curing die, which forms the desired cross section. The result is a high strength product, ready to use as it leaves the pultruder. The process is irreversible; the resultant form cannot be changed under heat or pressure, unlike PVC or aluminum that can be remelted and will deform under pressure. In the extrusion process the aluminum ingot and PVC pellets are heated to a ductile state prior to entering the die. The fiberglass mats, rovings, and resin enter the die at room temperature. Within the die there are several zones of temperature (heating and cooling) throughout its length, which activates the thermosetting reaction (polymerization), which under high temperature and pressure, the composite is cured (hardened). Fiberglass is a man-made fiber, produced from silica, SiO2 (silicon dioxide), CaCo3 (lime) calcium carbonate, NaC03 (sodium carbonate). The manufacturing process for glass fibers suitable for reinforcement uses large furnaces to gradually melt the sand/chemical mix to liquid form. It is then extruded (pushed) through platinum tipped bushings with small orifices – typically 16 micrometers (.00063 inch) in diameter for E-Glass, 9 micrometers (0.00035 inch) for S-Glass and in other processes, sub-micron openings are used for microfiber. The individual filaments drawing at speeds of 200 km/hr (125 mph) are bound together into bundles of typically 4,000 separate filaments called rovings. Rovings are then either used directly as glass reinforcement in the pultrusion process or further processed to manufacture fabric mat. Rovings provides great longitudinal ultimate tensile strength of 200,000 to 300,000 pfsi (pounds force/square inch) (2368 Mpa). Fiberglass multidirectional mat is wrapped on both the interior and exterior of profile to provide transverse strength. Polyester Resin – minimum 20%The balance made up of fillers (limestone, clay) and additives (catalyst, lubricants, UV inhibitors, fire retarder).The physical properties of pultruded fiberglass profiles are far greater than other fiberglass processes, such as molded fiberglass applications (e.g. swimming pools, boats, storage tanks), which have lower glass content (typically 30%) and thus lower strengths.Fiberglass pultrusion is a fabrication process to produce lineal profiles, that brings high performance space-age composites into the window and door market. As we move into a discussion about window systems, where comments are made to specific material (fiberglass, aluminum, vinyl and wood), they are made as general comments applicable to the material. Where specific material performances are quoted, they have been provided in order to make comparisons. All values quoted are approximate and for general guidance only. Wood: Has general properties, but different types of wood: Oak, Pine, Cedar, and Balsa all perform differently under different criteria. PVC: Has many formulas and additives, virgin and regrind, and with or without metal reinforcement. Architectural Aluminum: Is constant; the variable is the efficiency of the thermal barrier. Fiberglass: is an engineered product that can vary with the pultruder’s ratio of glass to resins, as well as the resin formula and additives. Beyond the basic material evaluation is design. Within each material there are examples of both high and poor quality. Window engineers can either maximize the properties of the material into their designs or in the interest of economy, create new defects into the product. Unfortunately windows get “type cast” as either good or bad based on the material from which they are made.